Service Conducted by The Rev Elkan D Levy, past President of the United Synagogue and past Chairman of the Chief Rabbinate Council and Mr David Jacobs, Director Synagogue Partnership Movement for Reform Judaism. בָּרוּךְ הַבָּא, בְּשֵׁם ה’; בֵּרַכְנוּכֶם מִבֵּית ה’. Baruch haba, b’ShemAdonai beyrachnuchem m’beit Adonai. Blessed is one who comes in the name of the Lord; weblessyou from the house of the Lord. Thank the Lord for He is good, His loving-kindness is for ever. Sh’ma yisra’el. Adonai eloheinu, Adonai echad. Echad eloheinu, gadol Adoneinu, kadosh sh’mo. ba-shamayim uva’ arets: L’cha Adonai ha-mamlachah v’ha-mitnassei l’chol l’rosh. Rom’mu Adonai eloheinu, v’hishtachavu l’har kodsho ki kadosh Adonai eloheinu. Listen, Israel, the Lord is our God, the Lord is One. One is our God; great is our Master; holy is His name. Yours, Lord, are the greatness and the power, the glory, majesty and splendour, for everything in heaven and earth is Yours. Yours, Lord, is the kingdom; You are exalted as head over all. Exalt the Lord our God and bow to His footstool; He is holy. Exalt the Lord our God, and bow at His holy mountain, for holy is the Lord our God. Books may not be thrown about from one place to another nor may they be treated disrespectfully. A man is required to have a scroll of Torah written with good ink, using a good quill, by competent scribes, on good sheets of parchment made out of hides. He is then to wrap it in beautiful silks, in keeping with the saying in Exodus Chapter 15 “This is my God, and I will glorify him”. The Instruction of the Lord is lucid making the eyes light up. They are sweeter than honey as it drips from the honeycomb. May the words of our mouths and the meditations of our hearts be acceptable to you, O Lord, our Rock and our Redeemer. It is exceedingly difficult, if not impossible, to account for the lofty teachings of the Hebrew prophets, the civilising influence of the great Law of Moses, the history of a small people who found God and brought Him to mankind, the Sinaitic revelation itself and the spiritual power these books continue to exercise over men’s souls, unless Israel really met with God and recorded in immortal language the meaning of that encounter. We can be sceptical of individual details in the Bible. We can dwell on the numerous parallels with Egyptian, Babylonian and Assyrian mores. What cannot be seriously doubted is the ‘something else’ which has ensured that this and no other collection of books has become the Sacred Scripture of a large proportion of humanity; that there are living Jews who regard themselves as the heirs to the Bible but no living Babylonians, Canaanites or Assyrians; that there is a Voice which speaks here in promise of great vision, of dreams of world peace, of holiness, justice and mercy, of freedom and the unique worth of each individual as a child of God. 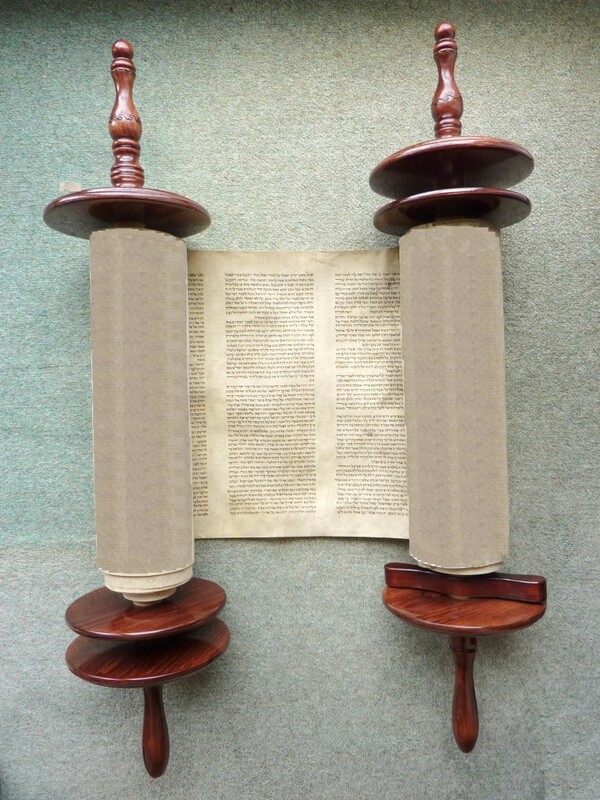 This is the Torah that Moses placed before the children of Israel, at the Lord’s commandment, by the hand of Moses. Hashiveinu Adonai eilecha v’nashuvah, chaddeish yameinu k’kedem. It is a tree of life to those who grasp it, and those who uphold it are happy. Its ways are ways of pleasantness, and all its paths are peace. Turn us back, O Lord, to You, and we will return. Renew our days as of old. Adon olam asher malach, b’terem kol y’tsir nivra. L’eit na’asah b’cheftso kol, azai melech sh’mo nikra. V’acharei kichlot ha-kol, l’vaddo yimloch nora. V’hu hayah v’hu hoveh, v’hu yihyeh b’tif’arah. V’hu echad v’ein sheini, l’hamshil lo l’hachbirah. B’li reishit b’li tachlit, v’lo ha-oz v’ha-misrah. V’hu eyli v’chai go’ali, v’tsur chevli b’yom tsarah. V’hu nissi umanos li, m’nat kosi b’yom ekra. B’yado afkid ruchi, b’eit ishan v’a’irah. V’im ruchi g’vi’ati, Adonai li v’lo ira. He alone will reign in awe. His might, His rule are everywhere. He is my God; my Redeemer lives. My cup, my portion when I cry. When I awake and when I sleep. Body and soul from harm will He keep. The Jewish Community in Cornwall was re-established in 1999. It continues the tradition of a faith community which began over 250 years ago when the Falmouth and Penzance communities, among others, came into being. Following the closure of Falmouth Synagogue in 1880 and Penzance Synagogue in 1906 there was a gap of almost 100 years before organised Jewish worship recommenced in Cornwall. The present community grew from a handful of Jews living in Cornwall who began holding services 15 years ago; they called themselves Kehillat (Hebrew for “Congregation of”) Kernow. There are now over 100 members, formal services are held on a regular basis, a constitution has been ratified, Charity Commission registration obtained, and the community is associated with the Movement for Reform Judaism. Congregational life has resumed, holidays are celebrated, life cycle events observed, children and adults are educated, and synagogue activities of a charitable, cultural and educational nature occur on a regular basis. From an informal meeting of several Jewish people who wanted to come together to share their common ground, Kehillat Kernow has become a recognised faith community not only in Cornwall, but also throughout Great Britain. This includes participation in the Board of Deputies and the Cornwall Interfaith Forum as well as interaction with the larger communities within Cornwall. Through our association with the Movement for Reform Judaism and support from the Chief Rabbi’s Office for Small Communities, most particularly through the dedicated services of D.